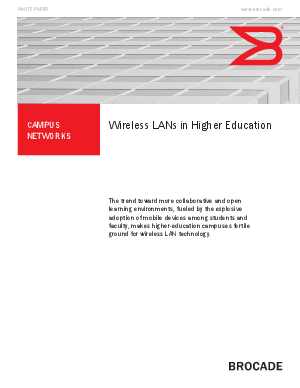 Wireless networking delivers value for both users and network administrators in higher-education institutions. For students and faculty—a particularly mobile group of technology enthusiasts—wireless networking enhances productivity and flexibility. With the industry’s broadest wired and wireless networking portfolio and a long history of delivering business-critical connectivity solutions, Brocade offers all the components necessary to deploy a wireless campus. These include multifunction 802.11n Access Points (APs), a wide range of highly available and scalable wireless controllers acting as the nerve center of the Wireless LAN (WLAN), and the industry’s leading wireless Intrusion Protection System (IPS).